Foxx: "The technology that's emerging raises questions." 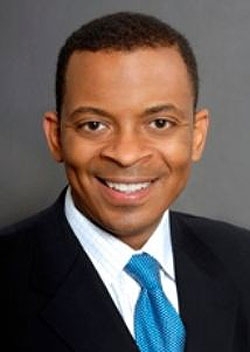 Transportation Secretary Anthony Foxx told reporters today he has concerns that wireless connectivity in cars could put drivers' privacy at risk – but the government is not rushing to judgment. Years after GPS became common, car companies are rushing to outfit their cars with dedicated wireless receivers so that drivers can take advantage of entertainment apps, safety technology and location-based features. Last week the U.S. Government Accountability Office put out a report that found inconsistencies in how automakers handle data from car owners, raising the possibility of privacy breaches. Just days later, Ford's global executive vice president of marketing and sales, Jim Farley, had to publicly apologize for remarking that Ford "know[s] everyone who breaks the law" based on GPS data. Foxx, speaking to reporters at the Detroit auto show, said the Department of Transportation is looking closely at the technology. "The technology that's emerging raises questions, and we're going to be responsive to those questions," Foxx said. "But each technology is different, and each application of it is different, and we want to make sure that we're striking the right balance between helping folks be safe but also making sure that their expectations of privacy are also weighed carefully." Foxx became transportation secretary last year, replacing Ray LaHood. He has scarcely talked about the auto industry, but this week in Washington he plans to give an address on his agenda. During his visit to Detroit, he praised the auto industry's revival since the government bailouts of General Motors and Chrysler. "The auto industry's back," he told reporters, "And of course, we're going to do everything we can to help Detroit come back as well."